As many of you know, I have a collection of antique all-bisque dolls. One of my favorite things about antique all-bisque dolls is the truly vast variety of types. When I was transitioning from collecting only modern miniatures and miniature dolls to antique dolls in the late 1980s to early 1990s, one of the very first books I read about antique dolls was All-Bisque and Half-Bisque Dolls by Genevieve Angione. Published in 1969, this classic book impressed upon me the great variety inherent in antique all-bisque dolls, and how focusing on the different varieties could make for a very interesting and fine collection. It was that book, plus Dolls in Miniature by Evelyn Ackerman that greatly influenced my beginning in the world of antique doll collecting. size. I often think that this doll is so rarely found today because not only were few made, but most of these dolls have long ago broken (transporting this doll requires very careful packing so the kneeling arms and legs do not knock into each other and into the body as well). There are several other things I love about this rare all-bisque. The number one thing is the exquisite chubby modeling of the torso, arms, and legs. 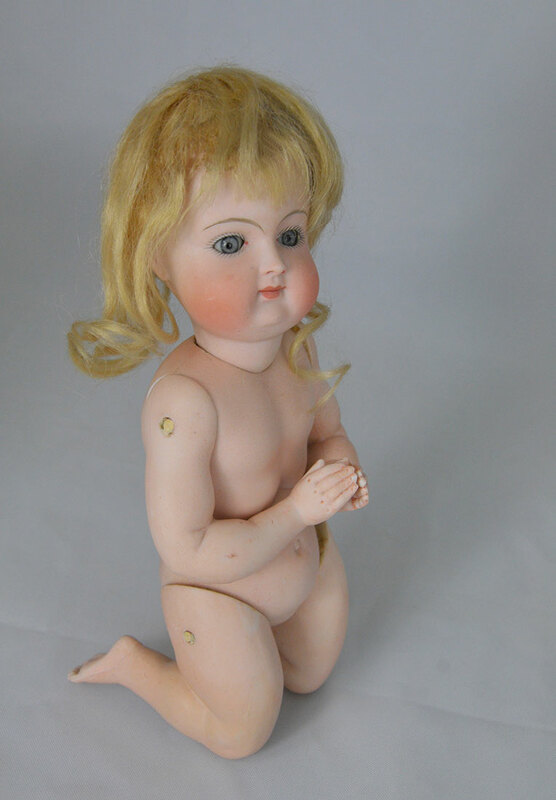 The doll is modeled to be in a praying position. I also love the plump, chubby-cheeked Kestner face that is so nicely painted–doesn’t she have a lovely expression? The doll has a blonde mohair wig, blue glass sleep eyes, and she is peg jointed. She is marked 1111. She is proudly displayed with a group of other Kestner all-bisque dolls in my collection, including this doll which I have written about previously. 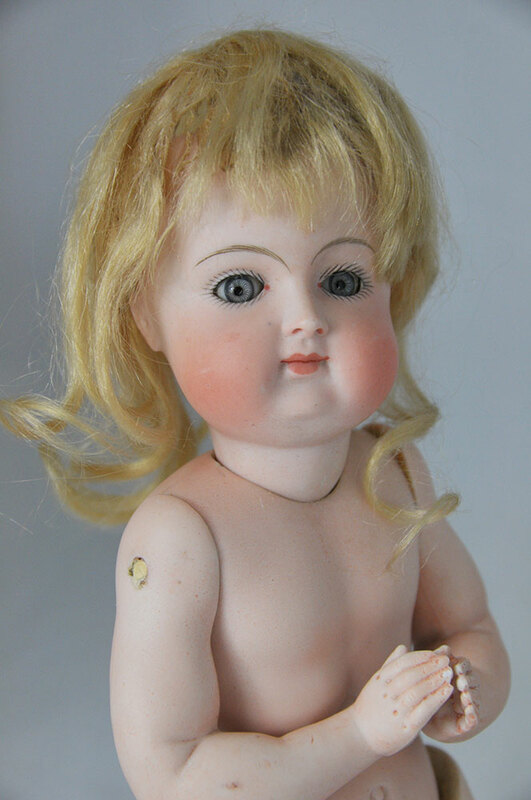 This entry was posted in All-Bisque Dolls, Antique Dolls, German Dolls. Bookmark the permalink.